While conserving water in California should always be a priority, it is especially important to put some effort into saving water in summer. Here are 3 simple tips that you can implement to make a difference in your water consumption. 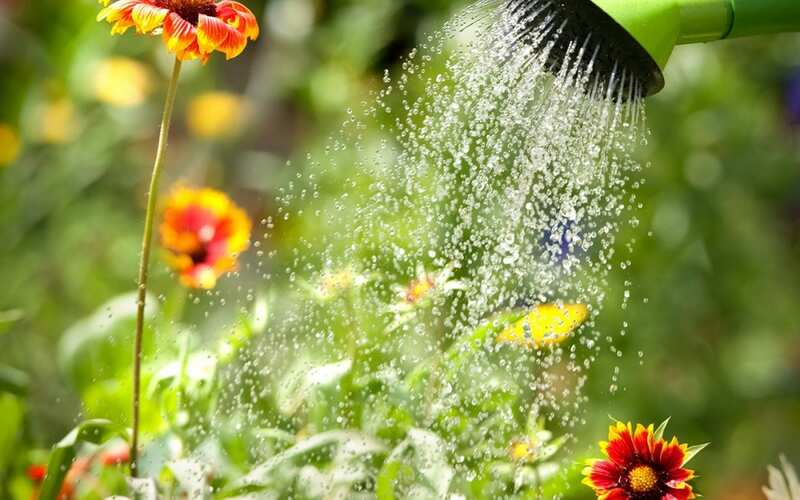 Using a hose to water your flowers and bushes covers more area and distance, however, you may be using more water than your favorite plants need. So, to start saving water in summer, consider filling up a heavy duty watering can with your outdoor water supply. If a hose is connected, make sure to test the temperature of the water before filling the can. Turn off the water before the can is filled so that you can completely drain the hose without wasting a drop. If possible, you can count the time in seconds from the spout handle turn to the end of the water flow from the hose. This way, you know how long you can catch the remaining liquid when refilling your watering can. Also, only fill your can with just enough water to give to your plants without any excess. When the sun starts to come up, the ground will still be cool from the overnight temperatures. This means that your grass will be able to absorb more water since it will not be lost through evaporation during the hottest time of the day. Once you begin to run your sprinklers, start a timer and monitor your grass. When you observe the ground starting to flood with too much water, turn off the water and note the total time elapsed. Use this as a basis for how long your sprinklers should stay on as you water your lawn. There are regulations in California that prohibit over-watering your lawn, so it is necessary to stay conscious of your sprinkler use not only for saving water in summer, but also to avoid fines. Between bathing suits and sweaty socks, you will likely have more laundry to keep clean and dry as you cool off from the heat. To keep saving water in the summer months, do your best to only run the washing machine with a full load of clothes. If possible, save your wash until you can fill your washing machine to three-quarter of the way full. Make sure not to fill the washing machine to the brim. Your clothes will not have enough room to properly turn, soak and spin. This will cause your clothes to smell musty and mildew-like, right out of the washing machine. If you must wash a small load, consider using hand-washing them in your sink instead. This will use a smaller amount of water, even if you were to soak and then rinse your garments using the faucet. Just makes sure that you have enough time to line dry the items, or you can throw them in the dryer with a dry towel to reduce the waiting time. For more water saving tips inside and outside of your home, check out this list of suggestions. Professional Inspection Network provides home inspection and commercial building inspection services for Southern California, including Orange County, Riverside County, Los Angeles, and San Diego. Contact us to book an appointment.